Commentary and Spiritual Perspectives, Ordinary 9, 2008. Commentary, historical background, poems and readings. Center for Liturgy, St Louis University. Preaching This Week at WorkingPreacher.org, Luther Seminary. Jesus Now, Proper (Ordinary) 9A, lectionary, study and worship resources from Faith Futures Jesus Then & Now. Rumors, for June 1, 2008, Ralph Milton, "Sermon helps for preachers with a sense of humor." Sermon Brainwave, June 1, 2008. Lectionary podcast featuring professors discussing the week's passages in light of current events. At Luther Seminary's WorkingPreacher.org. Tuesday Lectionary Leanings, "We're All Bozos On This Bus" Edition, RevGalBlogPals lectionary discussion, 2008. "Just Do It," Laurel A. Dykstra, "Uncomfortable Words," Living the Word, Sojourners Online, 2008. The Saturday Night Theologian, Exegesis of Word and World, Tod O.L. Mundo, Progressive Theology Weblog, 2008. "He Breaks the Bow and Shatters the Spear: Peace Poetry for Memorial Day, 2008," The Journey with Jesus: Notes to Myself, Daniel B. Clendenin, Journey with Jesus Foundation, 2008. Dylan's Lectionary Blog, Proper 4. Biblical Scholar Sarah Dylan Breuer looks at readings for the coming Sunday in the lectionary of the Episcopal Church, 2005. "Under the Surface of Life: Just As I Am," The Journey with Jesus: Notes to Myself, Daniel B. Clendenin, Journey with Jesus Foundation, 2005. "Seeking an E-Bay Path to Heaven," Timothy Nakayama, Proclaiming Gospel Justice: Reflections on the Scriptures and Progressive Spirituality, The Witness, 2005. "The Sign-off to the Moral Nightly News," Mark Harris, Proclaiming Gospel Justice: Reflections on the Scriptures and Progressive Spirituality, The Witness, 2005. "Another Way to Build," (2005) and "The Godward Side of Judgement," (2002) Barry Robinson, Keeping the Faith in Babylon, at at Richard J. Fairchild's Sermon & Lectionary Resources. "A Sprig of Hope," Frederick Buechner Sermon Illustrations. "Faith for All Seasons," The Rev. James F. Bracher, Day 1, 2005. Mustard Seeds, "Finding Firm Footing," Proper 4, 2008. A lectionary-based ideas resource for leaders of contemporary worship, Ann Scull, Gippsland, Australia. Liturgy for the Celebration of Life, Pentecost 3A. Liturgies from a Progressive/Post-Liberal Theology, Revd Rex A.E. Hunt, The Uniting Church of St James Curtin, ACT. 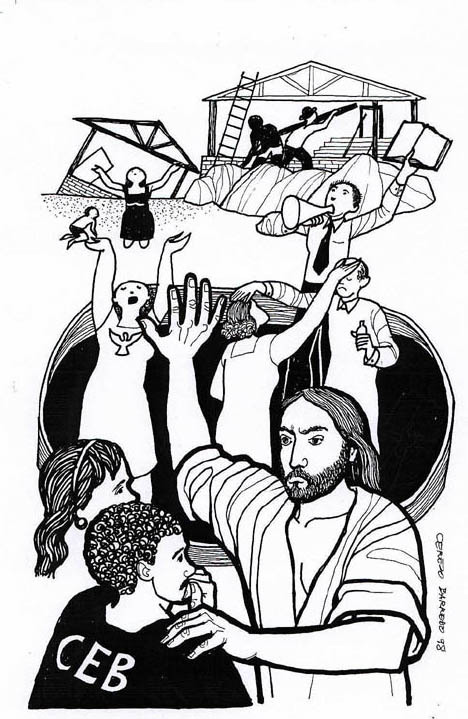 Lectionary Liturgies, Ordinary 9, Thom M. Shuman, Presbyterian Church (U.S.A.). Worship and Liturgy Resources, Ordinary 9, by Rev David Beswick, Uniting Church in Australia. Lector's Notes, OT 9, Gregory Warnusz, Saint Jerome Parish, Bellefontaine Neighbors, MO. Notes and commentary for those reading this week's lectionary texts to the congregation. Clip Art Images: Matthew 7:21-29, Misioneros Del Sagrado Corazón en el Perú. Ordinary 9 at Cerezo Barredo's weekly gospel illustration. Follows Latin American Roman Catholic gospel reading, though most gospels texts/themes are found in the index. Liberation emphasis. "The Power of Prayer," Brenton Prigge, NewHymn. Lectionary Puzzles, Proper 4. Word search puzzles in RTF or plain text, by Reg McMillan, St.Stephen's Presbyterian Church, Peterborough, Ontario.